The Short Version: Few art forms invoke romance quite like a ballet does. Boston Ballet provides Bostonians and travelers the opportunity to experience the seductive elegance of the ballet at the ornate and luxurious Boston Opera House. The dance company delivers traditional classics and innovative performances in multiple shows each season. In addition to its performances, Boston Ballet educates the community about ballet with its Warm Up pre-show experience, which gives patrons insight into the art of ballet. Get in your finest duds and take your love to Boston Ballet to deepen your bond through a rich cultural atmosphere. Think of all the great love stories you’ve heard. They all have something that makes your heart open up just a little. It could be an amorous night at the opera or a moonlit walk by a fountain. A romantic evening can transport couples out of the everyday of sweatpants, takeout, and TV and into a memory they’ll treasure for years to come. For a memorable date night, consider going to Boston Ballet. The graceful movement of the dancers is breathtaking to behold, and there’s something deeply moving about the experience. Each year, Boston Ballet stirs the hearts of more than 180,000 patrons with its many groundbreaking performances. You can take your favorite date to the Boston Opera House to experience a bit of that loving feeling at the ballet. Additionally, Boston Ballet has developed many educational programs to make the art form more accessible to people of all ages, backgrounds, and experiences. Warm-Up, a pre-show experience at the ballet, delights patrons with interactive displays that showcase various aspects of the show, including ballet positions, background information about choreographers, and dancer biographies. These displays serve as nice conversation starters for patrons and provide helpful context for every performance. Comprised of 66 dancers from 16 countries, the full Company represents the highest caliber of international talent on the Boston stage. Boston Ballet employs many hard-working, creative, and inspiring people. The dancers, artistic staff, stagers, stitchers, musicians, and administrative staff work seamlessly together to make this organization a leader in the industry. Boston Ballet puts on shows in the beautiful 2,500-seat Boston Opera House, which sets the stage for romance with its gold, crystal, and painted dome ceiling. The historic opera house surrounds you and your date with an opulence fit for royalty. Nothing says romance like putting on your Sunday best and escorting your date to the ballet. You can elevate your typical dinner-and-a-movie date by experiencing the old-world romance of an opera house. In spring 2018, Boston Ballet will put the love story of “Romeo and Juliet” to music. Pictured is Misa Kuranaga and Paulo Arrais. Photo by Liza Voll courtesy of Boston Ballet. A full-length narrative ballet, like “Romeo and Juliet,” tells a tale from beginning to end through a number of dance acts. The acts tend to be lengthy, but an intermission offers audience members a break to consider what they’ve seen. Couples can take this opportunity to have a discussion about the show and how it makes them feel. Intermission is also a great time to have a cocktail, admire the architecture of the Opera House, and chat with other patrons. In addition to “Romeo and Juliet,” Boston Ballet will feature two romantic classic ballets this spring: Marius Petipa’s “The Sleeping Beauty,” and August Bournonville’s “La Sylphide.” Either of these shows would be superb for Bostonians seeking a special date night. Mixed repertory ballets are a wonderful option for anyone new to the ballet. These programs consist of three or four short dances. The performance may have a certain theme, or it may have a more contemporary and fluid style; it may showcase the work of one choreographer or a sampling of a few. The diverse styles and shorter format appeal to audience members who haven’t been to the ballet before and want to see what it’s all about. This spring season, Boston Ballet will present two mixed-repertory programs, including Parts In Suite, which offers three distinct dances in one program, and Classic Balanchine, which celebrates the choreographer George Balanchine’s imaginative style. Each of these multifaceted programs evoke a wide array of feelings in audience members, who can witness the many joys of dance in a single evening. Lisa said mixed repertory ballet is among her favorite styles of dance. “I love the uniqueness of each ballet with different styles all rolled up into one production,” she said. Ballet is a timeless form of communication. The dancers’ movements engage audiences in a shared cultural experience that goes beyond words. The ballet doesn’t need to be translated — just felt. Anyone can find meaning and beauty in this classic art. By subscribing to Boston Ballet for a season, you can get a valuable discount on ballet shows throughout the year. That means a year of excellent date nights! 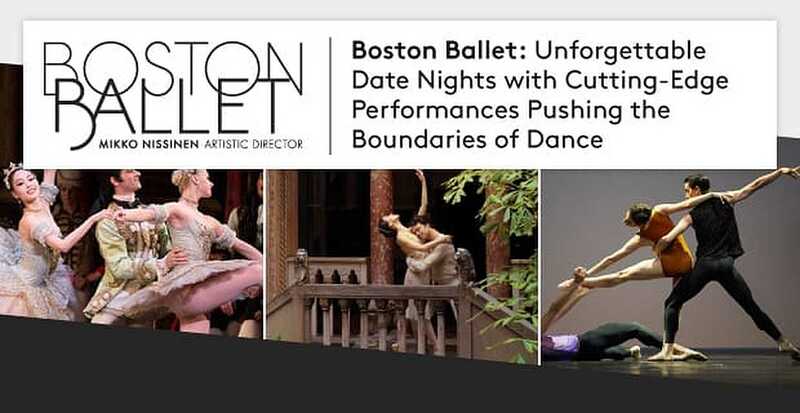 Becoming a regular patron of Boston Ballet is a great way to ensure that you and your favorite dance partner get a night out to connect over your shared interests.